Internationally inspired and manufactured home decor from Green Apple Home Style brings life and sophistication to any home or business. Cartaxo, Portugal is known as a place of sprawling vineyards and some of the best Portuguese wine available, but this small town with a population that hovers around 25,000 also houses the headquarters of Green Apple International Trading, a company that designs and creates furniture, linen, and lighting products for homes and hotels under its Green Apple Home Style line. Green Apple Home Style is all about promoting a European design aesthetic that infuses simple designs with an elegant, feminine touch. Their home decor designs are a favorite of the buyers who frequent Markets in places like Las Vegas and High Point, not only because they’re of great quality, but because the company puts a lot of time and effort into their booths. In fact, they were named “Best of Show” out of 4,000 vendors at the AmericasMart Atlanta market. Wow! 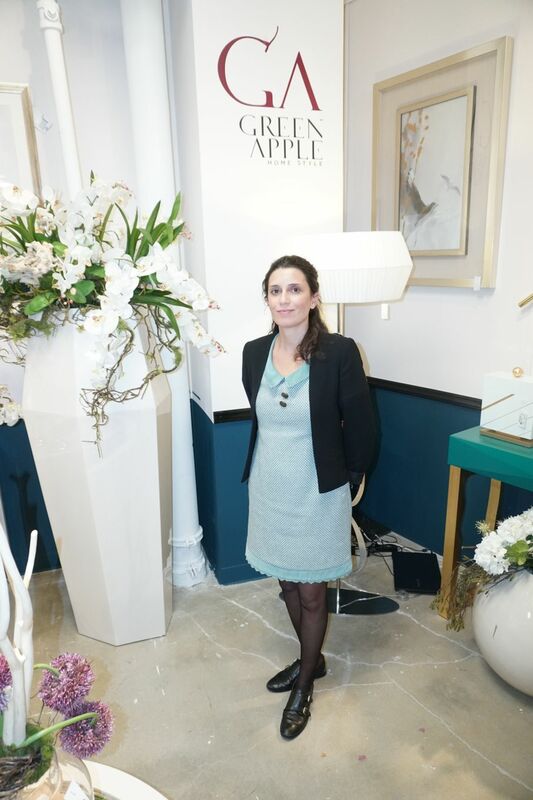 As luck would have it, we were given the chance to check out their booth at High Point Market and interview Rute Martins, the chief marketing office (CMO) of Green Apple Home Style, about the company’s newest styles and design inspiration. This was Green Apple Home Style’s third time at High Point Market. As always, they used their time at the nation’s largest home furniture and decor expo to introduce a number of new products. One such item, a recent bestseller, is a beautiful, statement-worthy coffee table. Crafter with three different types of marble, the table design was inspired by a woman’s bracelet one of the designers saw on display. Because they want their products to be customizable whenever possible, Green Apple Home Style offers this particular model in multiple colors, including mint. According to Rute, “Gold accents are really big right now, as are brown and beige hues.” These are a lot of the other trends considered “in” right now are found throughout Green Apple Home Designs’ collections. In addition to this soft vibe, the creative team also infuses the collection with Portuguese-inspired details. For example, a new console on the product line includes features that mimic those used by historic Portuguese navigators. “Portugal has a rich cultural history, so we add that to our pieces as well,” she told us. At the end of the day, Green Apple Home Style has a definitive vibe. “We aren’t just selling furniture. We’re selling sophistication and glamour,” Rute says. In today’s consumerist world, it’s so easy for any of us to buy something that we like, but aren’t necessarily connected to. Green Apple Home Style is committed to giving buyers a product that tells a story so they immediately connect with each piece. “People want to create a relationship with the products and we provide them with something special so they can,” says Rute. We understand, and we’re absolutely connecting with everything we’ve seen so far by Green Apple Home Style. If you fall in love with a product, be sure to inquire about customizable options, such as sizes, colors, fabrics, and more.